I had an epiphany on my yoga mat recently that I would love to tell you about, but first a quick back-story. This summer, I was sharing with my coach that I couldn’t name the kind of coach that I am. I have never felt like a life coach, or a career coach, a leadership or an executive coach, though many aspects of each resonate with me and are reflected in my coaching. I felt like, after ten years of coaching, I should be able to name it. Not only should I be able to name it, I really wanted to name it. I know there is power in naming things. I have seen that power over and over again, personally and with clients. I sensed that this naming would be key to my continued personal growth as well as to my professional growth and contribution to others. Hearing my issue, my coach suggested I ask a few clients what kind of coach they think I am. So I did, with interesting and helpful results. One client said I was a career coach, another said I was a life coach and the third said I was a work-life coach. The third client elaborated: she came to me about work issues, as most of my clients do, but then we moved into her whole life and the opportunities and challenges there. And I liked that a lot: a “work-life coach for professional women”. I was very grateful for my clients’ input, and I felt there was still something missing. Well, on my yoga mat in my bedroom a few weeks ago, after months of extra personal growth work, my creative juices were flowing. It hit me: what I stand for is work-life synergy. This is what I have been striving for in my own life. It has been the underlying, unnamed, theme in my coaching. Now I can bring it out into the open and name it: I am a work life-synergy coach for professional women. This feels so right to me – I have felt so excited ever since! I am feeling the power of naming it and am thrilled to imagine future possibilities. So, to elaborate, what I really stand for, and help clients achieve, is work-life synergy. Synergy here means: your whole is greater than the sum of your parts. When you are connected in your mind, body and spirit (that’s the beginning of “Making Room For You”), you create this synergy inside yourself – you become a larger whole. You can then begin to bring your full, whole self to your work (be it paid or unpaid), and to the rest of your life. Further, you can find and cultivate a relationship between your work and life which is synergistic so that they feed off of each other, nurture each other (more than they detract from each other). You can be proactive, and intentionally create synergies where before you may have only seen obstacles or challenges (this connects to growth mindset, one of my favorite concepts!). When you are living work-life synergy, you are energized, engaged, on purpose, joyful and so much more in love with work-life and the possibilities it holds for you. So, you expand as a greater, more powerful whole and therefore the positive contribution you can make to the world expands too. The image that this conjures up for me is a big upward, ever climbing, ever-expanding spiral, with no limits, full of possibility! 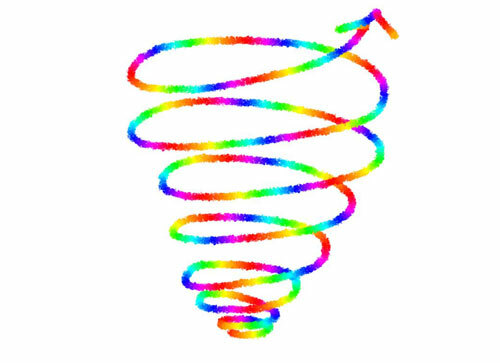 You spiral upward, instead of being stuck, frustrated, ruminating and scattered and spinning round and round in flat circles. If the spinning gets really bad, you might feel yourself spiralling downwards, like a big drill into the dark depths. This is exhausting and overwhelming. It can be also depressing and can cause burnout. When you find work-life synergy, there still may be times when you start to spin, but you have the tools to more quickly and effectively move out of spinning and back to spiralling upwards. You are more resilient. The idea of work-life balance has never resonated with me at all. I feel like balance is a precarious thing, a tower that can topple at any moment. It also puts work and life in opposition to each other, separate and competing. This really turns me off. I have a negative, visceral reaction to it. But give me work-life synergy and I have the opposite visceral reaction – excitement! • You are standing in the kitchen, facing a sink full of dirty dishes. Instead of feeling resentful of having to wash all of these dishes, you remember that you often come up with a good solution to a problem you have at work. So you start washing the dishes, open to possibilities rather than contracted by resentment. • You love running and want company on your runs. So, you get a few colleagues at the office to join you for a standing lunchtime running date. You get exercise, company and end up building some really supportive relationships at work. Not only that, with your running buddies, you come up with some helpful solutions to some challenges in your company culture. • You have been doing some volunteering for a cause you love. It has been so fulfilling for you to contribute in this way. You have been energized by it. You notice that when you are volunteering, you are more enthusiastic and outgoing than when you are at work. You decide to practice that way of being at work too and, lo and behold, you begin to feel more satisfied and are performing better at work. • Can you see the synergy that happened for me embedded in this post? These are just a few examples I cooked up for you. There is so much more! What does the idea of work-life synergy conjure up for you? I would love to see your answer below in the comment section. I will be sure to reply!